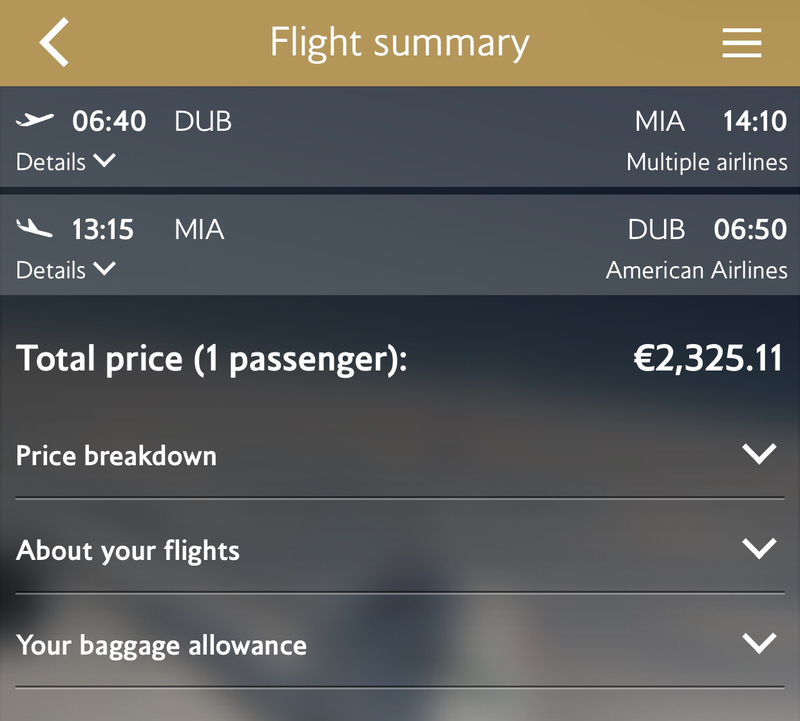 Last year I managed to buy a return flight ticket from Dublin to Miami on Business Class with American Airlines/Iberia for £900.The DUB-JFK-MIA was on American Airlines but the return journey was from Miami to Dublin via Madrid on Iberia, which was great! I got to sample the Iberia business class seat which was similar to the new Malaysia Airlines fully-reclined lie flat business class seats to Australia on their Airbus A330s. The usual price for this trip normally in the region of €2000-3000 depending on the season. It was definitely cheap and I like travelling from Dublin as you are avoiding paying the UK APD tax. But the best thing of all, you do the mandatory US Pre-Clearance checks at Dublin Airport rather than at JFK. That means you are arriving in JFK as if you are flying domestics: out of the plane and straight to baggage area! No queuing up at the immigrations. The journey itself was via JFK. I had about 2 hours transit in JFK which was fine. The flight from DUB to JFK was on a Boeing 757 in a 2-2 business class formation as you could see below. The choices of food on the menu were not that bad considering it was a quick hop across the Atlantic. I arrived at JFK Terminal 8 on time and I went straight to the American Airlines Admirals Club Lounge for a quick rest before my next flight to Miami. Arriving at Miami Airport couldn’t be easier. No queues at the immigration. Out of the plane and straight to the baggage area. Since my next flight to Sint Maarten was on the next day, I stayed at the Hyatt Centric South Beach Hotel which I will review in my next post.